The genus Ganoderma contains polypores that feature distinctive, double-walled, chambered-looking spores (see the illustration to the right). Without a microscope, one group of Ganoderma species is fairly easy to recognize, featuring "laccate" (shellacked or lacquered-looking) caps. The second group of Ganoderma species is a little less easily separated from other polypores without a microscope, although this group does contain the well-known "artist's fungus," Ganoderma applanatum; in this group the caps are dull brown. In both groups the pore surfaces bruise brown (sometimes slowly), and the flesh turns black with KOH. Species of Ganoderma are parasitic and saprobic on the wood of hardwoods or conifers, and are relatively picky about their substrate, rarely crossing the hardwood/conifer line and sometimes limiting themselves to certain trees. Ganoderma identification relies on many characters that are accessible without recourse to microscopic work, although measuring spores is also sometimes informative. The color of the flesh, when dried, ranges from white to pale brown to dark brown, and picking one of these three colors is important. 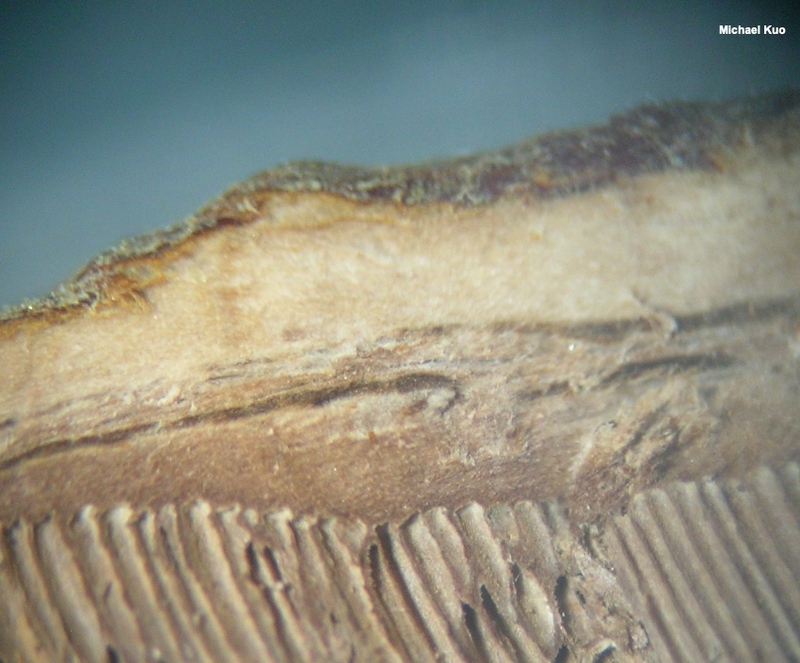 In some species the flesh features "concentric growth zones" (illustration), which can be seen as textural zonations when the surface has been sliced cleanly with a razor blade (a magnifying glass will help in assessing this feature). Another feature of the flesh in some Ganoderma species is the presence of "melanoid bands" (illustration), which are blackish, sub-shiny bands that, like the concentric growth zones, may be difficult to spot without a cleanly-cut edge and a magnifying glass. Other useful features in Ganoderma identification include the presence or absence of a stem, the kind of wood the mushroom is growing on, and the known ranges of the species. However, the stem (or pseudostem, or not-stem) is in my experience a very unreliable character, since species frequently develop stems when they're not "supposed to," and neglect to develop them when they "should." The North American species of Ganoderma have been confused and confusing for decades—especially the shellacked species. But recent publications by Loyd and collaborators (2017, 2018) have studied hundreds of North American collections and focused the picture substantially. 1. Cap surface with a shellacked, lacquered-looking appearance, with colors ranging from red to orange, yellow, and brown. 1. Cap surface dull and brown. 2. Flesh (especially as dried) white to whitish; growing on the wood of conifers. 2. Flesh pale to dark brown; growing on the wood of hardwoods or conifers. 3. Known from the Pacific Northwest and California; medium-sized to very large; spores 11–15+ µm long. 3. Known from northern Midwest, northeastern, and Appalachian ecosystems, usually on the wood of eastern hemlock (also from Arizona and New Mexico); small to medium sized; spores 9–12 µm long. 4. Flesh dark brown; southern and southeastern in distribution. 4. Flesh pale brown; variously distributed. 5. Growing from the wood of palms or other monocots; melanoid bands (see discussion above) absent from flesh. 5. Not growing on the wood of monocots; melanoid bands present in flesh. 6. Known only from tropical areas; pseudostem usually absent. 6. Known from the southeastern United States in general, including tropical areas; pseudostem usually present. 7. Found in western North America. 7. Found east of the Rocky Mountains. 8. Non-native species known only from isolated populations in northern California and Utah (probably as an escapee from cultivation); stem or pseudostem usually present. 8. Native species known from California, Oregon, and Washington; stem usually absent. 9. Melanoid bands present in flesh (see discussion above). 10. Growing on the wood of hardwoods; widely distributed east of the Rocky Mountains. 10. Growing on the wood of pines; known from the southeastern United States. 11. Concentric growth zones absent (see discussion above); spores 9–13.5 µm long; usually featuring a stem or pseudostem; known from the southeastern states. 11. Concentric growth zones present; spores variously sized; only rarely featuring a stem or pseudostem; variously distributed. 12. 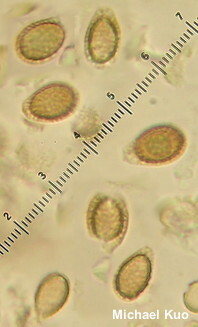 Known from tropical areas; spores 8.5–9.5 µm long. 12. Widely distributed east of the Rocky Mountains; spores 10–14 µm long. 13. Flesh extremely thin (nearly non-existent); spores 11–14 µm long; known only from southern California. 13. Flesh not extremely thin; spores 6–12.5 µm long; variously distributed. 14. Cap surface thin enough to be easily punctured with thumb pressure; producing a new cap each year beneath the previous year's cap; spores 10–12.5 µm long. 14. Cap surface tough and not easily punctured; producing new tube layers each year on the same cap; spores variously sized. 15. Spores 9–12 µm long; known only from California. 15. Spores 6–9 µm long; widely distributed in North America. Gilbertson, R. L. & Ryvarden, L. (1986). North American polypores. Vol. 1. Oslo: Fungiflora. Ginns, J. (2017). Polypores of British Columbia (Fungi: Basidiomycota). Province of British Columbia, Victoria, British Columbia. Technical Report 104. 260 pp. Justo, A., O. Miettinen, D. Floudas, B. Ortiz-Santana, E. Skökvist, D. Lindner, K. Nakasone, T. Niemelä, K. -H. Larsson, L. Ryvarden & D. S. Hibbett (2017). A revised family-level classification of the Polyporales (Basidiomycota). Fungal Biology 121: 798–824. Loyd, A. L., J. A. Smith, B. S. Richter, R. A. Blanchette & M. E. Smith (2017). 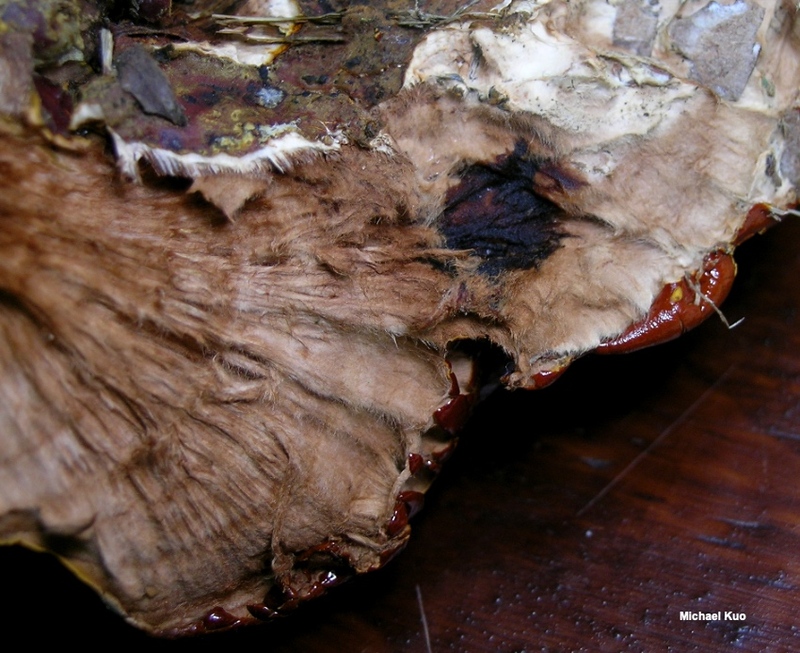 The laccate Ganoderma of the southeastern United States: A cosmopolitan and important genus of wood decay fungi. University of Florida IFAS Extension publication PP333. Loyd, A. L., C. W. Barnes, B. W. Held, M. J. Schink, M. E. Smith, J. A. Smith & R. A. Blanchette (2018). Elucidating "lucidum": Distinguishing the diverse laccate Ganoderma species of the United States. PLOS One 13: e0199738. Niemelä, T. & O. Miettinen (2008). The identity of Ganoderma applanatum (Basidiomycota). Taxon 57: 963–966. Overholts, L. O. (1953). The Polyporaceae of the United States, Alaska and Canada. Ann Arbor: University of Michigan Press. 466 pp. Torres-Torres, M. G., L. Ryvarden & L. Guzmán-Dávalos (2015). Ganoderma subgenus Ganoderma in Mexico. Revista Mexicana de Micologia 41: 27–45.